The artwork at EphemeraNow is phenomenal, but it looks even better in person. I just got a print from the collection of ad art and it literally flys off the page. charter member in the printer project. You'll get a discounted, large-format print for your trouble. I put up 17 new images at Patent Room this week, including this unhappy barbecue stand. There is also a 1934 Cadillac by Corvette designer Harley Earl. Check 'em out. 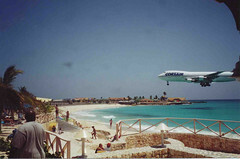 I ran across this dramatic photo on flickr of an airplane landing at St. Martin/St. Maarten. And yes, this is authentic. Here's a similar photo taken from a different angle. My new time waster, Patent Room, is now up and running. The site is a collection of early 20th Century technical drawings I've uncovered in old patents. It's similar to my aircraft design collection. I decided to spin off a new site to hold a greater variety images. I only have a few drawings up now, but I'll be adding more each week. I received an interesting spam today. The image above shows the e-mail as it appeared with a portion of it blown up. (Click the image to see a larger version) The sender has used fixed-space type, at a very small font size, to form the message. Very ingenious. And depressing. I'm fascinated by the World War II-era Japanese submarine that was found by researchers off the coast of Hawaii. This is no ordinary submarine. It's an underwater aircraft carrier. The submarine carried three bombers in a watertight hanger. A large door gave planes access to the deck, where they would be prepared for flight. The planes would launch from tracks on the submarine's deck. More information on this class of submarine is available here and here. The submarine aircraft carrier seems like a much more practical idea than the flying submarine. Richard Ames notices a connection between a number of musicians who died in aircraft crashes. They seem to have a propensity for hiring unqualified pilots. Yahoo offers some information on their new blogging tool. It's not yet in beta, but you can sign up to be alerted when it is. Update: More on Yahoo! 360 from Jeremy Zawodny and Marcel van Leeuwen. When subscription cards fall from magazines Andrew Kirk is reading, he stacks them in a pile at the corner of his desk. At the end of each month, he puts them in the mail but leaves them blank so that the advertiser is forced to pay the business reply postage without gaining a new subscriber. Life can involve big hardships, like being fired or smashing up your car. There is only so much you can do about them. But far more prevalent - and perhaps in the long run just as insidious - are life's many little annoyances. These, you can do something about. My new header graphic was taken by my son on San Juan Bay, Puerto Rico, last November. Fortune has put together a list of 75 books that, they say, "teach you everything you really need to know about business." "Cyberbullies, mostly ages 9 to 14, are using the anonymity of the Web to mete out pain without witnessing the consequences." Philipp Lenssen is seeing if he can create the shortest Google search page. By dropping the formalities of the head, body and open form tags he has the entire page down to 39 characters. Music-licensing costs threaten to keep a number of popular TV shows off DVD. This interactive chart shows the relationships between the major search engines.